My name is Robert Scott Ater and I was 14 1/2 years old when I went to be with the Lord forever on April 22, 2006 at 1:00 pm. I was born with a congenital brain malformation called a migrational cell defect. It affected the outer layering of my brain. 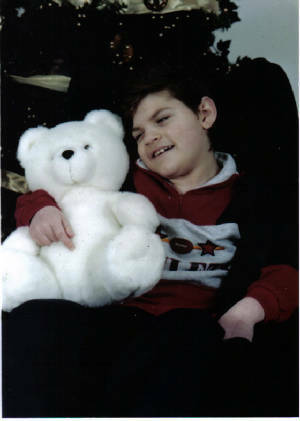 As a result, at 2 1/2 months old I began having horrible seizures. My mom and dad did everything they could to help me but I lost milestones daily. The only hope was in a procedure called a "Hemispherectomy". The doctor's evaluated me and after I turned 18 months old they took me into surgery to remove the right side of my brain. I did really well. But...I contracted salmonella meningitis 4 months later and the seizures returned, and I had endured 6 more brain surgeries,including the placement of a VP Shunt. I was in ICU for several weeks and they didn't think that I was going to live. 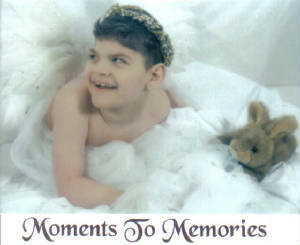 It was a very rare disease to get but I was the "unusual" from birth, and I was such a fighter that I recovered. Alot of things happened though along the way...I had to have a g-button placed before the brain surgery and a Nissan. That changed the way I ate,which was now through a tube in my stomach. I had a great Mom and Dad who really loved me and took really good care of me. Over the years my lungs started to become a problem and I developed asthma as well as chronic lung disease. 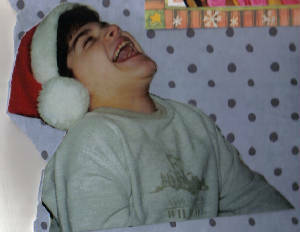 I had floppy-airways and my seizures never did get under control, about 3-30 a day....everyday. I tried to get better but my body was wearing out. I was always on medications...besides my regulars, I was on an antibiotic and steroids for lung infections all the time and eventually I needed oxygen...but that didn't help much...I then contracted the RSV Virus, and eventually my parents had to have an ethics committe meeting with all my doctors...by this time I have had over 11 brain surgeries and 32 body surgeries, for all kinds of things. The doctor's kept telling my parents that I was ready for Hospice, and my parents became very sad. I now was not able to digest my food any longer (That diagnosis is called Terminal Feeding Intolerance. They said that when a person's brain begins the process of shutting the body down, often it is the GI system that is the first to go. The GI system is a big organ system and very vital and connected to the brain with lots of big nerves. When the brain starts to shut down and the gut gets "turned off" it is very painful for the person to continue being fed) and my lungs were also getting weaker...I coughed all the time, and had to be suctioned over 50 times a day over a 24 hour period. All day and night.No one really got any rest. My parents and doctors did not want to put a trach in as it was only preventing the inevitable...I would have been on a ventilator and that would not have been fair to me. About 3weeks after the meeting, I started to have kidney shutdown and I was not tolerating any of my feedings anymore....a decision was then sadly made to let me go home. After 7 days without food,or meds....I peacefully went home to God with Jesus. My family misses me very much and I loved them as much as they loved me. I miss them too. But I have a new body now....I was once profoundly disabled...I couldn't walk, sit, talk (except for MAMA) and now I am running and doing all kinds of things in Heaven. I have lots of friends here...one who is my Mom's dear friends daughter, Mischa, she was 2 1/2 days old when she got here. I hold her and sing to her! I am living for the very first time in my life now and it feels great. My mama cries alot but she'll be okay. She knows where I am. Someday we will be together again. I have 4 sisters....Jen, Alisha, Elaina and Jamie. I have 7 nephews...Taylor, Devynn, Vincent, Joshua, Jordyn, Mason and Weston and one niece...Jeweleah. I know they miss me too. My mama did everything she could for me and I couldn't have asked for better parents. God hand picked them just for me. I was closest with my mama but I sure loved my daddy too, and my sissies. I had great nurses who took real good care of me. There was Sharon, Kathy, Rachael and Letha. I was a very lucky boy to have had so many good people in my earth life. I can't wait to see all of them in Heaven someday. Say prayers for my mama....and daddy. They are having to adjust alot to life on earth without me...but it will be okay. God is blessing everyone whose life I have touched....I will only be a memory away. On this home page, my mother will share all kinds of things with you...the one thing she cannot share though...is her broken heart. It is beyond any words to describe. There is a place deep within her heart that will be reserved for the day she sees me again...and only then. In the meantime, God is filling her life with His work and directing her path. 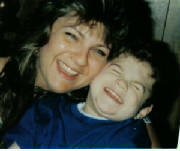 I want everyone who wants to see me look at this site and to remember that my Mother needs your support....and my Dad. My sisters could use a prayer and a hug too. I was totally okay with who and how I was...please don't feel sorry for me...be happy! After you view my site, say a special prayer for me and my Mama and Daddy. 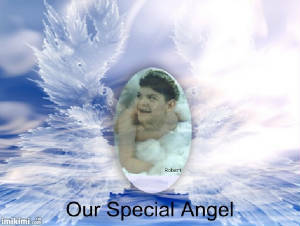 Don't forget my sisters and all those whose lives were touched by me, because MY LIFE was definitly touched by theirs! I really do see Angels now! 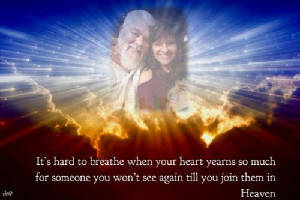 My Mama and Daddy are so special and always loved me so very much, I could not have asked for better parents! 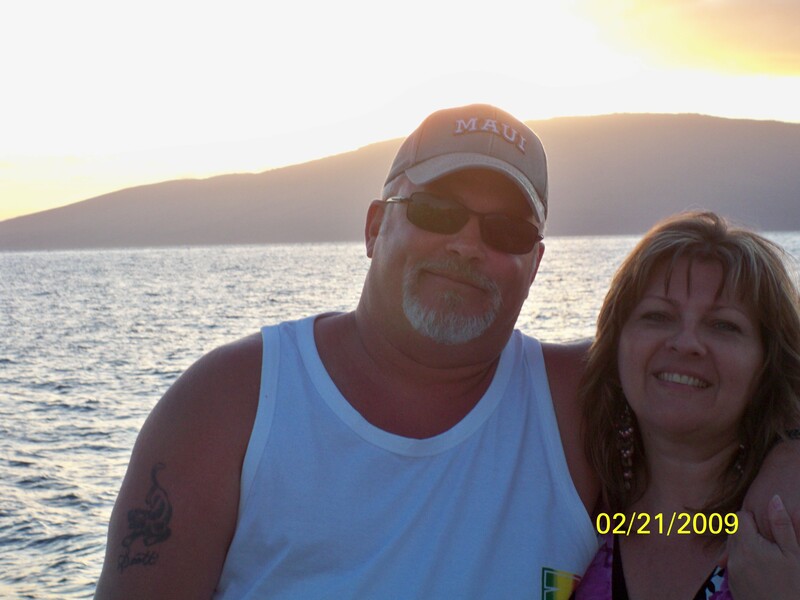 Mama and Daddy in Hawaii February 2009 on their 20th Wedding Anniversary! Having a wonderful time!!!!! Here I would like to tell you all about a special miracle that I gave to my Mama, with God's help, the night before I died. Having the Loving Mama that I had, on that night before, having been in a deep trance like sleep, I awoke from my nearing of death and with a room full of people to witness God's great Mercy and Love...I looked directly at my mother and she was immediately alerted as to my awakening and staring at her...I had a smile so big for her! She said softly and sweetly....I love you baby, and I replied so everyone could hear...I love you too mama. (though not as clear as a "normal" child, I said it in a way that was clear enough for all to understand that this was what I was saying). Everyone started to cry...grabbing onto each other and repeating what they had heard me say...tears running down my Mama's face, she then asked me "Do you see Poppy and Brother Don"?, I nodded 3 times yes! Then she asked me, "Do you see Jesus and the Angels"? Once again I nodded 3 times and continued to smile at her. I then had delivered the miracle and "glimpse" of hope that she so needed to hear. I then closed my eyes and shortly after 4 epiodes would follow where I would begin to stop breathing....by the next morning...I stopped breathing every 15 minutes for up to 3 plus minutes each time....she would (the hospice nurse) prepare to announce me gone and then I'd breathe again. My mother lay beside me each time...encouraging me to go home...but she kept telling me that when I went I was taking her heart with me...so God provided a way to allow me to leave...he knew my mother trusted Him...but she had to get out of His way and really let me go...let my heart stop beating...I could feel her heart beating each time and it was bringing me back...so she left the room to go and pray with her dear friend Melinda, upon ending the prayer an agreement was made that she was ready to release me over to Him and when she was coming back to me...God stopped her with my sister Alisha's request to see a scrapbook that would be placed at the funeral home for viewing....only 10 short minutes out of God's way...while sharing the tearful smiles of those photos's...God's beautiful son Jesus came to take me home. The nurse came out and stated that it was over....I had passed on. My mother flew into my room and cried..."I'll love you forever Robert". Then she began to thank God over and over and over again. It was so beautiful.Of course my Daddy and sisters were there too and after a few minutes they took some photographs of them with me...all around my head! With their tearful faces...I watched from Heaven above...and knew I'd miss them too. Jesus told me that all would be well and that God and He were going to take care of them all...until we met again. That I did not need to worry about missing them as I would still be with them...that once I saw heaven, I would be joyfully awaiting thier arrival...all my tears ended just then and I was reminded of the scripture that says "He will wipe away every tear".... There was so much LOVE in this room...in these hearts and within this family! This was my special miracle from God of how Robert was being made whole right before my eyes...the rest I would have to wait to see until my time comes to meet Jesus...and of course standing beside Him will be Robert. I will probably collapse into Jesus' arms and then into my precious sons'. I thank God everyday for that memory. And those who witnessed a child speak who once could not...witness a child nod yes, to having been asked a direct question ...not once,but twice...what a blessing they recieved...what an honor and privelage God gave to them to witness that! Their lives were meant to see this for God's purpose! I am so grateful,and I wanted to share it with you all as well. Blessings, Autumn. (Poppy was Robert's grandfather who passed just 7 days earlier).Brother Don was our pastor who died 5 years earlier and adored Robert..he believed Robert was a divine appointment for him and they had a special relationship and understanding of spiritual things...we miss him greatly too. He and I were very close and he was like a dad to me and loved me and our family from the very depths of his heart).